"Through the music, we show a different vision of the Middle East today," says oud virtuoso and composer Kenan Adnawi. This vision celebrates the continuing relevance and profound musicality of one of the oldest cultures in the world. Pear-shaped and short-necked, the oud is one of the world's first stringed instruments, and it is central to musical traditions across the Middle East. 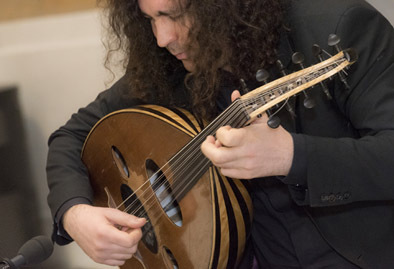 The oud is played in Syrian classical and folk music, which include the tradition of taksim, improvisation building upon shared structures, much like Indian ragas. The oud is also used for pure improvisation, a tradition known as irtejal. Adnawi's Massachusetts-based quartet which also includes Layth Sidiq on Arabic violin, Jamal Sinna on qanun (a plucked stringed instrument similar to the zither), and Tareq Rantisi on percussion-plays all these Syrian styles to perfection. Growing up in Syria, Adnawi was drawn to music from a very young age. He began studying oud at age 7 under the tutelage of two of his brothers; he went on to study with Azerbajani oud master Askar Ali Akbar at the prestigious High Music Institute of Damascus, from which he received his undergraduate degree in 2008. Already a three-time winner at Syria's national youth competition, Adnawi's prodigious musical talents then garnered him first place in the 2009 International Oud Competition in Beirut, Lebanon. He subsequently toured the world playing with Marcel Khalife and his Al-Mayadeen Ensemble, the Qatar Philharmonic, and others. Based in Boston since 2013, he received a Masters Degree Music from the New England Conservatory in 2016. "We are still playing music and creating a vision for the future," Kenan Adnawi notes, in a rich cultural tradition in which "you build on what the people before have done, just like the process of life."